The information provided below offers a look at all the Colorado train rides and railroad museums available throughout the Centennial State. But first, a brief history. Arguably no other place in America boasted such a fascinating collection of railroads as Colorado. Its history with the iron horse coincided with the Transcontinental Railroad's development although its first train did not appear until after that project's completion. When the great "Silver Boom" began in 1879, following the precious metal's discovery near Leadville, railroading took flight. Due to the rugged topography many lines were built to the 3-foot right-of-way as a means of reducing construction costs. For this reason, Colorado would proclaim the densest network of "narrow-gauge" railroads in the country. Some of the more notable include the Denver, South Park & Pacific; Denver & Rio Grande (later the Denver & Rio Grande Western, it originally had no connection to the mining boom); Rio Grand Southern; Colorado Central; and Uintah Railway. In many cases, engineers had to devise ingenious ways of carving routes out of the Rocky Mountains, resulting in several spectacular locations such as the Hanging Bridge within the Royal Gorge, Colorado Central's Georgetown Loop, and the 6.21-mile Moffat Tunnel. Several of these live on today as tourist attractions with names like the Durango & Silverton Narrow Gauge (D&SNG); Cumbres & Toltec Scenic (C&TS); Royal Gorge Route; Georgetown Loop; and others. The state's involvement with the railroad began just after its 1859 gold rush although trains had nothing to do with this endeavor. Instead, it was all related to the Transcontinental Railroad. The Union Pacific, formally organized in May, 1863, was heading west from Omaha, Nebraska (where it held its groundbreaking ceremonies on December 1, 1863) with intentions of joining the Central Pacific (building east from Sacramento, California) somewhere near the Sierra-Nevada Mountains. After serious consideration officials opted against building through the fledgling community of Denver, Colorado Territory (Colorado achieved statehood on August 1, 1876). Instead, the line would turn north through southern Wyoming. According to an in-depth analysis Trains Magazine published in its January, 2007 issue entitled, "Great Railroading: State-By-State," Denver's jilted businessmen felt compelled to right this wrong by building their own railroad to meet Union Pacific's westward advance. As the book, "All Hail The Denver Pacific: Denver's First Railroad" by author Thomas Noel points out, what was known as the Denver Pacific Railway & Telegraph Company was formally incorporated on November 19, 1867. Construction began south from the small outpost of Cheyenne in 1869 and reached Evans, Colorado on January 1, 1870. After less than a year of construction the line was completed to Denver (106 miles) on June 26th that same year. On January 24, 1880 the Denver Pacific merged with the Union Pacific Railway and Kansas Pacific (linking Kansas City with Denver) to form the Union Pacific Railway. Please note! This information relates only to Colorado train rides as they pertain to vacation/tourism destinations. Also, if you are interested specific events, such as "The Polar Express," Halloween, Thomas the Tank Engine excursions, or fall foliage events please visit the main tourist trains section of this website. This museum is part of Windsor's historical exhibits related to the area's history. Part of their collection includes a preserved/restored Greeley, Salt Lake & Pacific Railway (Organized on January 17, 1881, the GSL&P was financed by the original Union Pacific Railroad. Following its bankruptcy, it became a part of the Colorado & Southern in 1898, which itself was acquired by the growing Chicago, Burlington & Quincy on December 19, 1908.) wooden depot built in 1882, a caboose, and other railroad displays. Additional exhibits to peruse within the greater Boardwalk Park include the Eaton House, a schoolhouse, a German-Russian farmhouse, a beet-shanty, and a prayer-meeting house. The museum is open from Memorial Day to Labor Day each season from Thursday through Sunday (please visit the town's website to find out exact hours of operation). Admission is free although donations are welcome. The Castle Rock Museum is operated by the Castle Rock Historical Society, housed within the town's preserved and restored Denver & Rio Grande stone (rhyolite) depot completed in 1875. The building does not sit at its original location, however, and was moved from its trackside perch in 1970. In 1974 it was placed on the National Register Of Historic Places and Castle Rock's Register Of Local Landmarks in 1994. According to the historical society, formed in 1991 to preserve the structure, it still carries its original interior, ticket window, baggage area, and more than a century of "graffiti on its walls." There are various exhibits on display and admission is free of charge. The museum is open year-round although only on select days of the week. To learn more and plan a visit please visit the society's website. 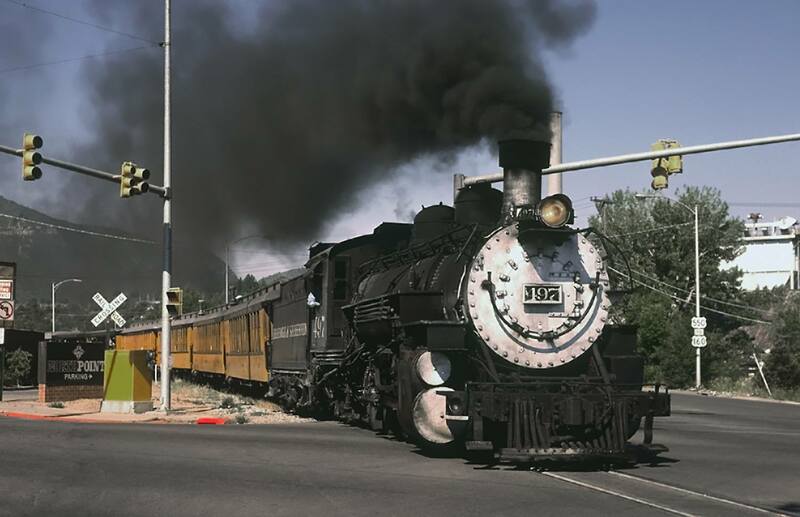 One of the most enjoyable of Colorado train rides can be found at his museum in Golden; the state's largest such facility which aims to keep alive its fascinating history with the iron horse. The organization was formed in 1959 and has grown considerably over that time. They currently feature two replica depots and preserve thirteen steam locomotives of either standard or narrow-gauge. A few are operational to host train rides around the grounds (along with other special events during the year). These include American Oil 0-4-0T #1; Manitou & Pike's Peak Railway 0-4-2 #1 (cog); Union Pacific 0-6-0 #4455; Colorado & North Western 2-8-0 #30 (36-inch); Denver & Rio Grande Western 2-8-0 #318 (36-inch); Denver, South Park & Pacific 2-8-0 #191 (36-inch); Denver & Rio Grande 2-8-0 #683, Denver & Rio Grande Western 2-8-0 #346 (36-inch, operational); Denver & Rio Grande Western 2-8-2 #491 (36-inch, operational); Chicago, Burlington & Quincy 4-8-4 #5629; West Side Lumber 3-truck Shay #14, and West Side Lumber 3-truck Shay #12 (operational). Other equipment include diesel locomotives, rare "Galloping Geese" rail cars originally operated on the Rio Grande Southern, and several passenger cars. Colorado train rides at the Cripple Creek and Victor Narrow Gauge Railroad are somewhat unique in that its width is only 2 feet, not the standard 3-feet of most others. It is based in Cripple Creek, Colorado, is another of the state's many narrow-gauge tourist attractions. The little railroad has been in operation since the summer of 1967, growing into a popular entertainment venue since that time. Its operation covers a total of 4 miles, utilizing former segments of two historic narrow-gauge systems; the Midland Terminal Railway and Florence & Cripple Creek Railroad. They currently have four small steam locomotives on the property, all of various historical stature: 0-4-0 #2 (built by Henschel & Sohn of Germany in 1936), 0-4-0T #3 (H.K. Porter, 1927), 0-4-4-0 #1 (another German-built locomotive, a product of Orenstein & Koppel in 1902), and 0-4-4-0T #4 (a Mallet-type locomotive built by an English firm, W. G. Bagnall, in 1947 for a South African sugar plantation). The CC&VNG operating season is normally from late May through early October. 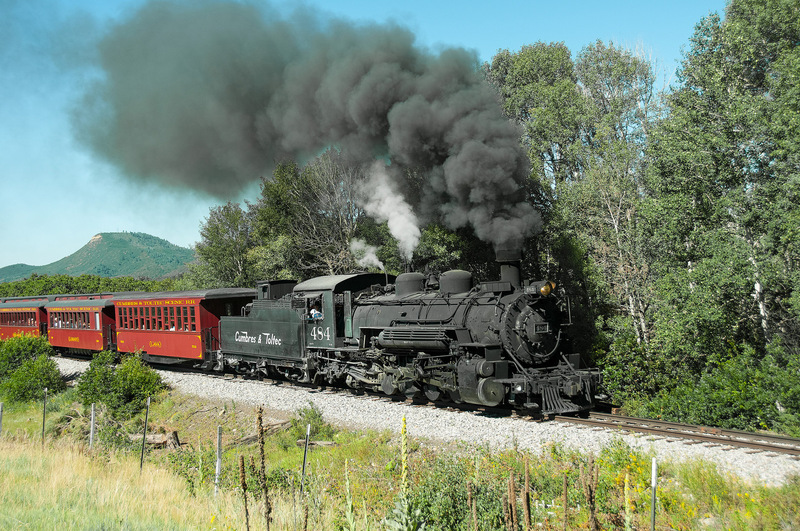 Aside from the Durango & Silverton, the most popular of all Colorado train rides is found at the Cumbres & Toltec Scenic, which enjoys tens of thousands of visitors annually. Its heritage interweaves with the nearby Durango & Silverton Narrow Gauge as both utilize former sections of Rio Grande's famed 36-inch gauge network in southwestern Colorado. The creation of the C&TS begins in the 1960's when the D&RGW sought abandonment of this unprofitable trackage which had garnered only lukewarm revenue for decades. In its final years the railroad witnessed an increased interest as a tourist attraction, playing host to many excursions. As a result, the state stepped in and purchased the Durango-Silverton section in 1970. Together with New Mexico, Colorado also acquired the Antonio - Chama segment, creating today's Cumbres & Toltec Scenic. The original steam locomotives and all structures can still be found along both preserved sections. The most popular of all Colorado train rides is the marquee Durango & Silverton Narrow-Gauge, which operates the fabled narrow gauge lines of the former Denver & Rio Grande Western. Folks from far and wide have ridden this national treasure which continues to use the same steam locomotives that operated under the D&RGW. After completing the deal with the Rio Grande in 1970, Colorado received all remaining steam locomotives, freight cars/equipment, and buildings/shops. In total, the D&SNG received eight original Denver & Rio Grande Western steam locomotives while the C&TS picked up nine. Today, nearly all are operational. Currently, the Durango & Silverton’s passenger trains are pulled by these vintage and authentic narrow gauge locomotives that operate a 45-mile route between Durango and Silverton. The railroad also hosts many special events and trains throughout the operating season. This organization, established in 1961, is located along Brighton Boulevard in Denver with more than 600 transportation-related artifacts. Their slogan "Anything on Wheels" rings quite true as you can see everything from locomotives and automobiles to airplanes and bicycles. The museum's locomotives include 0-4-0 #7 (built by Henschel & Sohn o f Germany in 1930), Cora-Texas Plantation 0-4-4T #108 (a 36-inch tank engine built by H.K. Porter in 1897), Chicago & North Western 4-6-0 #444 (built by American Locomotive in 1906 as a Class R-1 "Ten-Wheeler"), and Union Pacific 4-8-8-4 "Big Boy" #4005 (manufactured by Alco in October, 1941). The latter is the group's prized piece and one of the largest steamers ever built. Their were 25 of these giants constructed in the early 1940's to tackle the stiff grades over the Wasatch Mountains and Wyoming's Sherman Hill. Today, eight are preserved with one, #4014, owned by Union Pacific. Except major holidays the Forney Museum is open throughout most of the year. If you are interested in Colorado train rides centered around interurban/trolley history you may want to visit the Fort Collins Municipal Railway, based in Fort Collins. This tourist train operates 1.5-miles of the former Denver & Interurban Railroad, an interurban public-transit system that once served the city. The history of the D&I, a subsidiary of the Colorado & Southern, can be traced back to its opening in Fort Collins on December 29, 1907. This system also operated a much larger network stretching 51 miles from Denver to Boulder which then looped back to the former city. It also maintained a short branch to nearby Eldorado Springs. Early on the D&I enjoyed some success as few steam railroads served its cities. However, as the automobile's popularity grew, Dr. George Hilton notes in his book, "The Electric Interurban Railways In America," deficits began appearing in 1920. As a means of curbing losses, service throughout Fort Collins was suspended on July 10, 1918. Today, the Fort Collins Municipal Railway operates restored Birney Safety Car #21. They normally run on weekends and host special excursions throughout the year. Arguably the most unique of all Colorado train rides can be found aboard Galloping Goose #5. This uniquely restored, historic rail car was returned to operating condition in 1998. 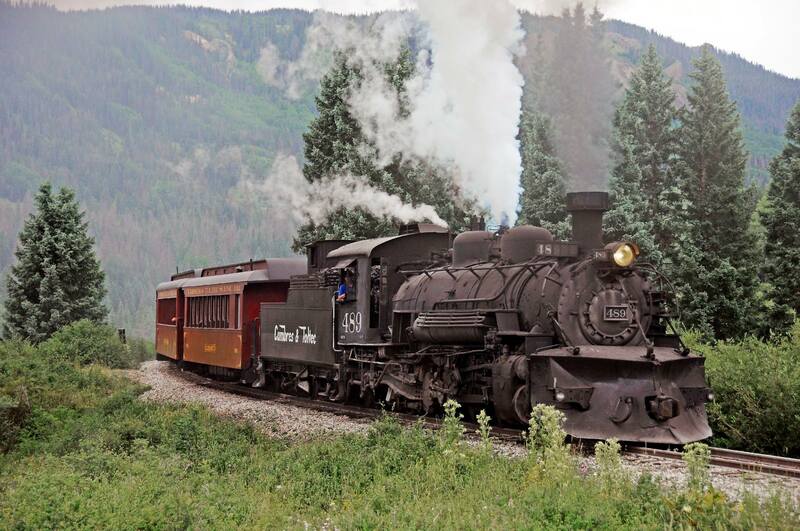 It now offers rides on the Cumbres & Toltec Scenic and Durango & Silverton during select times of the year. The narrow-gauge Georgetown Loop Railroad (maintained by the Colorado Historical Society as the Georgetown Loop Historic Mining & Railroad Park) operates a 2-mile segment of the former Colorado Central Railroad's narrow-gauge (36-inch) trackage between Georgetown and Silver Plume. Colorado train rides are largely centered around the state's historic narrow-gauge railroads and this attraction is now different. Its heritage can be traced back to 1881 as a Colorado Central subsidiary known as the Georgetown, Breckenridge & Leadville Railroad to serve the area's thriving silver mines. The Colorado Central was a far-reaching endeavor envisioned by William A.H. Loveland to build a standard-gauge main line from Golden to Hazard, near Cheyenne, Wyoming. Its narrow-gauge lines would subsequently serve the aforementioned mining towns but due to the very rugged topography around Clear Creek, engineers had to devise some incredible features to maintain manageable grades. These included horseshoe curves, 4% grades, four bridges across Clear Creek, and the Devil’s Gate High Bridge. The latter structure rose 95-feet over the gorge and is the Georgetown Loop's featured attraction today. This group's goal is to preserve and restore the Union Pacific's former roundhouse in Hugo, Colorado. They eventually plan to open a museum on the grounds. To learn more about their efforts please visit their website. Located in the town of Limon this museum is housed within the preserved Chicago, Rock Island & Pacific and Union Pacific union depot built in 1910. Originally constructed from wood it was later modernized in 1936 and is currently listed on the National Register Of Historic Places. While the latter railroad served much of eastern Colorado and directly reached Denver, the former was somewhat of an outlier. It also enjoyed service to Denver and Colorado Springs (its main line split at Limon) but only via a single route running west across Kansas. According to the museum they currently feature several displays along with a Union Pacific caboose and boxcar dating from the 1890's. While you are there also be sure to see other exhibits on display such as lunch counter-diner, sheep wagons, a Cheyenne tipi, working chuck wagon, and a one-room schoolhouse. Their open season runs from Memorial through Labor Day. The Leadville, Colorado & Southern is based in the historic mining town of Leadville (also known as the "the highest incorporated city in North America") and takes passengers through the spectacular Rocky Mountains on 2.5 hour trips, which depart from the town's restored Denver, South Park & Pacific (Colorado & Southern) brick/stone depot constructed in 1883. As far as Colorado train rides are concerned this attraction operates the last component of the DSP&P still in existence. The DSP&P grew into the second-largest narrow-gauge railroad throughout the Rocky Mountains with a network that wound its way some 340 miles from Denver to Gunnison and Leadville along with various branches. The DSP&P, also known as the "South Park Line," was incorporated on October 2, 1872, and remained profitable until about 1883. It was reorganized as the Denver, Leadville & Gunnison Railway in August, 1889 at which time it came under Union Pacific's control. Following UP's bankruptcy on October 13, 1893 the property became a part of the new Colorado & Southern in 1898, which itself came under Chicago, Burlington & Quincy's control in 1908. Most of the DSP&P was abandoned over the years except for very short segments, such as the LC&S's 10.5 miles which allows for 21 mile round trips. The tourist line utilizes a diesel, GP9 #1714 painted in LC&S colors, to pull its trains. There is also a preserved steam locomotive on display, Colorado & Southern 2-8-0 #641 (built by Alco's Brooks Works in 1906). Unquestionably the most unique of all Colorado train rides is this cog railway operates up Pike's Peak, along a line that covers nearly 9 miles and hosts trips lasting more than 3 hours. While this isn't a traditional tourist train it's tough to find one that affords such spectacular scenery. With tourism to Pike's Peak rapidly growing by the 1880's, the first attempt at constructing a railroad to the summit was chartered in 1884. It was to use standard adhesion to scale the mountain with a ruling grade of 5% and switchbacks to keep grades manageable. While some work was completed the plan stalled due to monetary issues. So, a cheaper alternative was arranged; a plain dirt wagon road. Before this latest plan could be completed, Zalmon Simmons rode a mule to the top and was so awestruck by the beauty that he firmly believed it should be available for the general public. Realizing that a railroad would be the best and most efficient means of transporting guests to the top, and with resources already available, Simmons founded the Pike's Peak & Manitou Railway in 1888. In 1889 the road was renamed as the Manitou & Pike's Peak Railway and began construction within the year. In 1890 the M&PP was opened about half way to the appropriately named Halfway House Hotel and by 1891 the route was completed to the Pike's Peak summit at 14,115 feet, 8.9 miles from Manitou. This museum is located in Craig and, as its name suggests, focuses on the history of northwest Colorado. Most of their collection focuses on subjects not related to the railroad. However, some noteworthy displays include a small model layout based on David Moffat's Denver & Salt Lake Railway as well as his private business car, named for daughter, Marcia. It has been beautifully restored and is available for tours. Moffat's D&SL began in 1902 to build a secondary route from Denver to Salt Lake City. However, he ran out of money in 1913 having only reached Craig, Colorado. According to Mike Schafer's took, "Classic American Railroads," part of the D&SL crossed 11,680-foot Rollins Pass. It was situated somewhat northwest of Denver and was only surmounted via a series of tortuous switchbacks, carrying grades as high as 4%. So difficult was this stretch that 23 miles of railroad were required to connect two points just 8 miles apart. To improve operations the city agreed in 1922 to help fund a new tunnel under James Peak. Following six years of work the $18 million project was completed in 1928 and named for D&SL's founder. Moffat Tunnel was 6.1 miles in length and reduced the trip from hours to a mere 15 minutes. If you're interested in additional Colorado train rides geared towards trolleys the Platte Valley Trolley offers just such an attraction. They operate from mid-April through the end of October every weekend using trolley cars along a route that allows for about a 25-minute ride. This heritage streetcar system is maintained by the Denver Tramway Heritage Society and was inaugurated on July 4, 1989. The Pueblo Railway Museum is based in Pueblo, Colorado and one of the state's growing such facilities. Its home is next to the beautifully restored Pueblo Union Depot, a large three-story stone building that opened in 1890 and originally used by the Denver & Rio Grande Western, Missouri Pacific, Colorado & Southern, and Atchison, Topeka & Santa Fe. The museum's featured displays are located outdoors on its storage tracks. It houses one notable steam locomotive, Santa Fe 4-8-4 #2912, a late-era design manufactured by Baldwin in 1944. In addition, there are several diesels on the property including Colorado Fuel & Iron 25-tonner #11 (General Electric), Fibreboard Products 44-tonner #1 (General Electric), Department of Transportation U30C #001, and three Chicago & North Western GP7's (#102-104, built in 1951, all are fully operational). In addition to these locomotives the group maintains a fleet of preserved freight and passenger cars. Admission is free. The Ridgway Railroad Museum, based in Ridgway states its primary mission as preserving the railroad heritage of Ouray County. Along with its collection of mostly narrow-gauge equipment the museum also offers train rides. The group does not have a steam or diesel locomotive preserved within its collection but does house one of the rare "Galloping Geese" operated by the Rio Grande Southern (RGS). This railroad was one of Colorado's largest and most interesting narrow-gauges. It was the last endeavor built to serve the mining boom within the San Juan Mountains, running from a connection with the Rio Grande at Ridgway to a Durango, utilizing a network that formed a rough "C." By the late 19th century the D&RG had acquired full control of the system. Much of it was abandoned and dismantled between August and September of 1952. While there is no restored depot on the grounds they do feature an RGS outhouse/coal storage building (the Denver & Rio Grande's depot in Ridgway is preserved albeit is currently a private residence). The museum is open only during the summer months from June 1st through September 30th. To learn more and plan a visit please visit their website. One of the newest Colorado train rides is the Rio Grande Scenic Railroad based in Alamosa, which has been in operation since 2006. 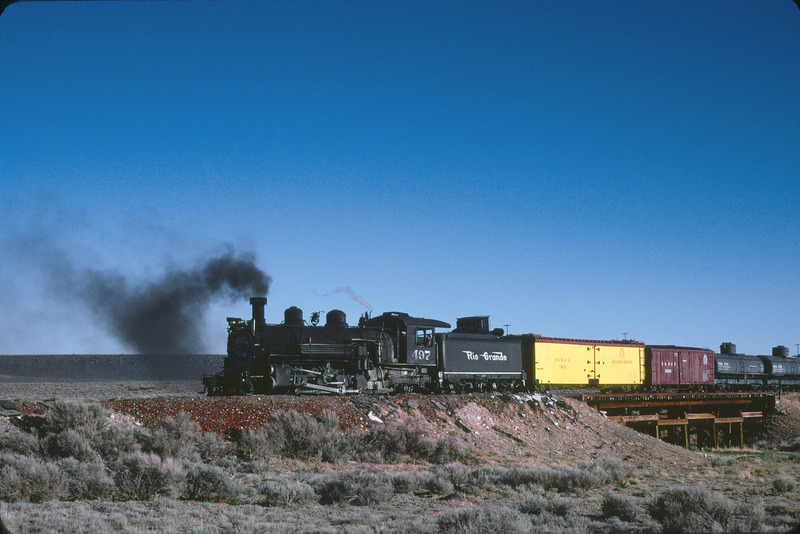 The railroad utilizes former Rio Grande trackage and connects with the popular narrow-gauge tourist line, Cumbres & Toltec Scenic at its southern terminus of Chama, New Mexico. The railroad has garnered quite a following due to southwestern Colorado's and northern New Mexico's stunning scenery. For power they employ two steam locomotives, 2-6-0 #1744 (built for the Southern Pacific by Baldwin in 1901) and 2-8-0 Consolidation, #18 (manufactured by American Locomotive's Pittsburgh Works in 1910). They also own a sister to #18, #20 (built by the Pittsburgh Works in 1910) as well as 2-truck Heisler #3 (built for Craig Mt. Lumber in 1917) and Great Lakes Carbon Corporation (US Navy) 0-4-0F #7 (a product of H.K. Porter, outshopped in June, 1941). Along with its steam fleet the railroad also retains a small operational fleet of General Electric B39-8E diesels, which are the true workhorses of the operation when their services are needed. In what many would argue is the most breathtaking of all Colorado train rides, the Royal Gorge Route Railroad operates part of the Denver & Rio Grande Western’s trackage through this beautiful natural wonder. The Royal Gorge Route owns 24 miles of this legendary stretch of the Rio Grande, departing daily from Cañon City, Colorado. The Royal Gorge Route was created in 1998 after Union Pacific decided to sell 12 miles of the Royal Gorge pass although the Class I railroad continues to own the rest of the dormant route. While the river and gorge remain the top attraction the Hanging Bridge also draws visitors, a structure built by the Santa Fe during the two railroad's war for the canyon. The structure uses angled supports anchored to each side of the canyon walls to sustain the bridge's weight over the river. It is a fascinating design that remains the keynote feature (during the Rio Grande's days it was a popular spot for publicity photos). Today, the Royal Gorge Route offers a variety of adventures from cab rides and group charters to several different excursions. 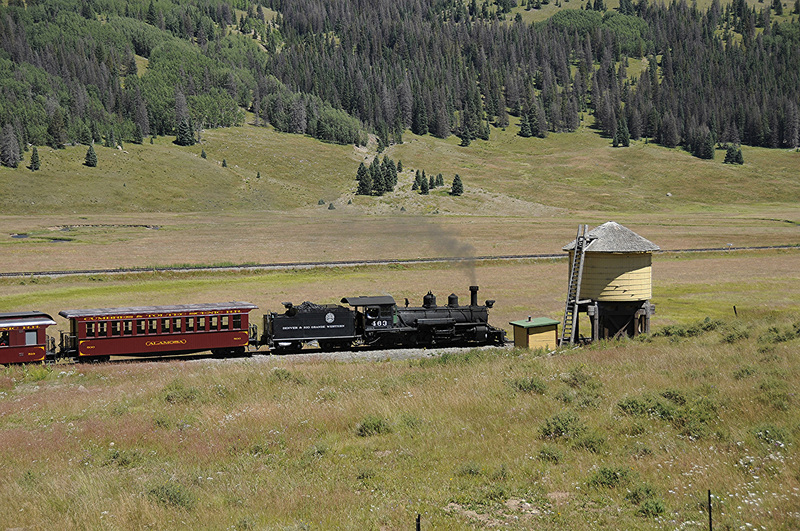 The Tiny Town Railroad is located in Morrison offering Colorado train rides using authentic, miniature steam locomotives. This attraction is somewhat unique in that the railroad operates through an entire, scale town, complete with every store and building one could imagine! Its history can actually be traced back over a century when George Turner built the "town" of "Turnerville" as an entertainment venue for his daughter in 1915. Just five years later it had garnered so much interest it opened to the public. By 1924 it contained some 125 buildings with roughly 20,000 visitors making the trek each year to see the town! Since that time it has had boom and bust periods although its modern era can be traced back to 1987 of what by then was known as "Tiny Town" was underway. By 1989 more than 60,000 folks were visiting the site annually, a number that has grown considerably since that time. Admission to the town is required with an operating season lasting from Memorial Day through Labor Day.